Now, we discuss at length what Nephi actually means by this statement in a different post, but let’s keep this one simple. This is not how salvation is obtained. Let’s use an analogy to illustrate the truth. Let’s pretend that we must have a ticket to get into the celestial kingdom. The Ticket of Salvation, if you will. Let’s say, for the sake of the analogy, that this ticket costs $100 (obviously it would be an infinitely larger number). We may have thought that if we worked as hard as we could our whole lives that we would be able to pay maybe a dollar, or even two, of that ticket price, and if we met that price, then Jesus would come in and pay the remaining $98. But only if we met our price first. That is not how it works! Jesus has paid the ENTIRE $100 for every person. He has purchased the ticket for you. The ENTIRE thing. It is paid for. That is why the scriptures say that we rely “wholly” (2 Nephi 31:19), “only” (2 Nephi 10:24), and “alone upon the merits of Christ” (Moroni 6:4). Now Jesus comes to you and asks you to do something—to meet some conditions—so He can give you the ticket. He says that you must have faith in Him (see John 3:16; Mosiah 3:9, 12) and repent of your sins (see Alma 42:13, Helaman 5:11) and that if you do these things you will be saved. By grace. Remember, He has already paid the entire price of the ticket. He has already earned salvation for you. He is not asking you to pay Him back or pay a part of the ticket price. All He asks of you is to have faith in Him and repent of your sins and then He will give you the ticket that He earned for you. When we keep any of the commandments or do any good work, it isn’t paying any portion of that ticket price. We don’t keep the commandments to earn salvation. We keep them for a much different reason! The ticket is paid for. The salvation is earned. Totally. When we keep the commandments, it should be because we love Jesus (see John 14:15). It should be because it is our nature to keep them. You see, when we truly have faith in Him and we truly repent of our sins, the Holy Ghost comes into our lives and changes our hearts so that we “have no more disposition to do evil, but to do good continually” (see Mosiah 5:2). Jesus calls this being born again and He says we must experience this change of heart or we cannot dwell with God (see John 3:3). Do you get it? Do you see the incredible gift that our Savior has given us? We are saved 100% by His grace apart from all we can do. But we are also changed by His grace so that we can do more! So that we are more! So that we can become like He is! Being saved by grace doesn’t mean that we don’t need to keep the commandments. It changes our nature so that we can and will keep them. In conclusion, the gospel should not be a stress. It should not be a strain. It should be empowering and joyful. Please don’t keep the commandments out of fear, obligation, or with an idea that you need to earn some portion of your salvation. Focus on having faith in Jesus and repenting of your sins. That is what allows Christ to change your heart. And once that change has happened, keeping the commandments will become second nature to you. Have faith and repent. Every day. That truly is all we can do. 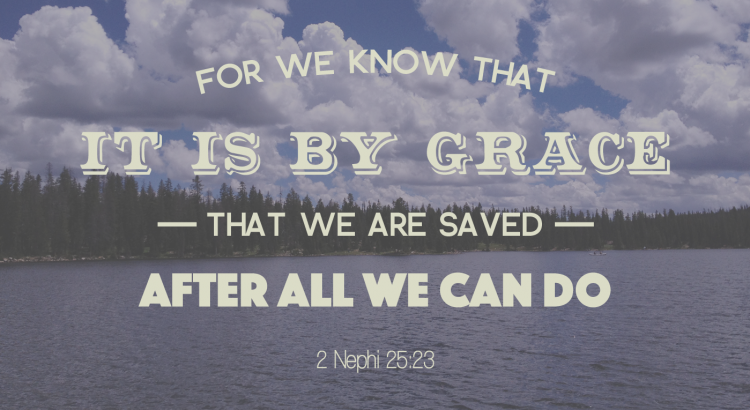 For a more thorough examination of grace and its connection to Nephi’s phrase “after all we can do”, including words from ancient and modern prophets, please click here.